When I write, I like the room to be dark. I write dark. “Dark for dark business,” as dwarves like to say. I like it to be atmospheric with incense and candles and a lava lamp. I have blackout shades in the room and often the only light is coming from the monitor, the candles, and the lava lamp. It makes the room transcendent but it poses some problems sometimes. Like if I need to cheat and look at the keys while I’m typing. Luckily for me, I’m a touch typist so I don’t have to look down often, but every once in a while I do. And often I can’t see the keys. Problem #1. Problem #2. 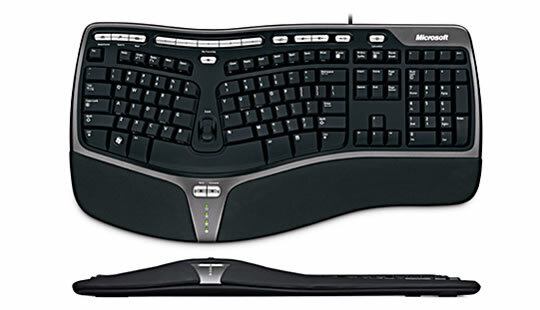 My keyboard of choice is the Microsoft Ergonomic Keyboard 4000. In my opinion, it is simply the best keyboard ever made. I have two issues with it however. The first issue is that it is not backlit. 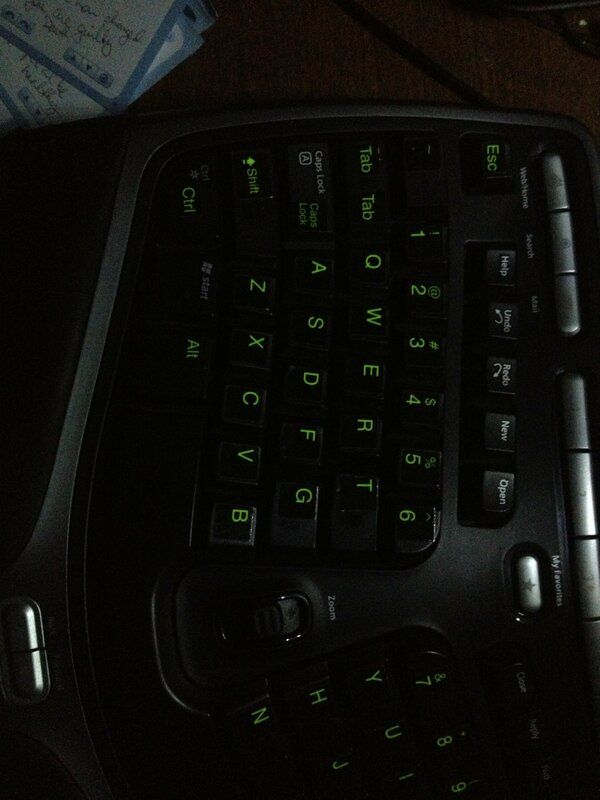 In fact, at the time of this writing, no one makes a backlit keyboard with the split key ‘ergonomic’ configuration. Backlit keyboards are not just for gamers. Some of us producers enjoy producing in low-light environments. 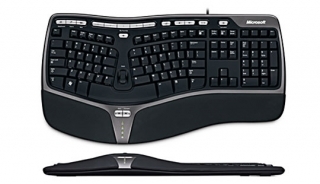 Hear me oh gods of ye Microsoft, produce for me a backlit Ergonomic Keyboard 4000 (or 7000) and Yea! I will purchase it! Heck, can we get a kickstarter up in this place? The second issue is a little more serious. Anyone who uses the MS Ergo Keyboard 4000 will readily notice that after about a year’s time, the symbols on the keys will wear off, leaving a nicely polished blank key. And it used to be that your only recourse was to simply buy another keyboard. They don’t retail for all that much, but it is kind of infuriating to have to buy a whole keyboard for a cosmetic – though functionally important – feature. 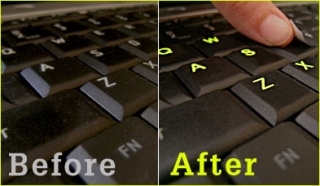 Solution: There are keyboard sticker keys that claim to glow. They don’t actually fluoresce of themselves and don’t even glow in the dark. They have some highly reflective material on them, like what road signs use and reflect a high percentage of any light that hits them back. I bought a set from a company I won’t name here and put them on my keyboard. The color I ordered was blue. They didn’t work at all. I needed the overhead light on if I wanted to see my keys. Also, they started wearing off as well. Leaving me with my second issue once again. Then I discovered MyGlowKeys. They are stickers that claim to do the same thing. I ordered a set in yellow and due to my previous experience, I was very skeptical. It took me about 45 minutes to scrape off the previous stickers and then stick the MyGlowKey stickers onto the keyboard. Then I turned out the lights and by the light of the monitor screen alone — Glory! 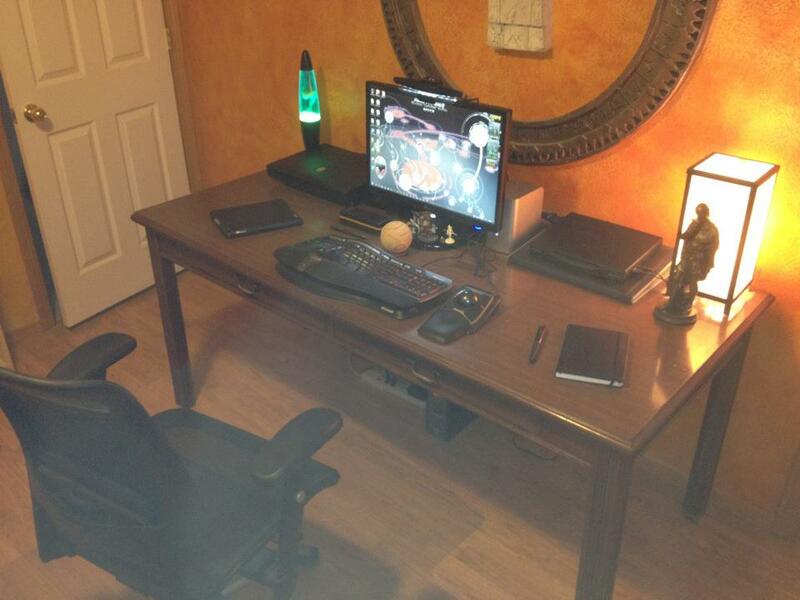 The keys shone brightly enough I could easily make them out by the light of the monitor screen and the lava lamp. I’ve used them for about 2 months now and the stickers show very little sign of wear. The best part is that these were very affordable. Two sheets will run someone $20 shipped! While a new Ergonomic 4000 keyboard is significantly more than that. This is a fantastic product for folks that write in low-light and can’t get a backlit keyboard for whatever reason. 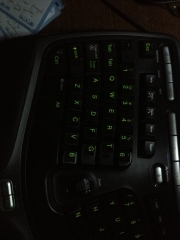 Below is an actual picture I took from my cell phone of my keyboard with the MyGlowKeys stickers put on. (Regrettably, I didn’t think of taking a “Before” picture.). Will MyGlowKeys replace a backlit keyboard? Absolutely not. But then they don’t cost nearly as much either. And will they allow you to see letters in the dark more accurately than your current method? Almost certainly. And for the price, it is worth giving them a try and seeing for yourself? They’ve earned a place in my book that’s for sure. As someone who has spent quite the time on the topic of typing: the best I’ve had so far is a mechanical keyboard with no labels (daskeyboard). But if you need to read your keys, yeah why not. I’m a touch typer, but have to look down once in a while. That Daskeyboard keeps it real! It is useful to the people who feel stress on eyes, Using Glow keys it highly reflective the key in darkness.